It’s no secret in the country music world, that Jerrod Niemann has found himself a lot of fans. His music can be a bit whimsical or even a bit nutty at times, and some is about as far from traditional country as you can get, but that didn’t stop him from putting a string of hits out on country radio. “Lover Lover,” “What Do You Want,” and “One More Drinking Song,” were all singles from Jerrod’s album, Judge Jerrod and the Hung Jury. The Judge has now given us another CD, full of songs that are sure to please his ever-growing fan base. My personal favorite, “Shinin’ On Me,’ was his first single from the new album. It got into the Top 20, and I was really surprised that it didn’t climb a lot higher. That one is definitely a ‘feel good song.’ Every time I listen to this CD, I find myself going back to that song to listen to it again. “Whiskey Kinda Way” and “I’ll Have to Kill the Pain” both have a traditional country sound, and give fans an opportunity to listen to the slower side of Jerrod. I could see either one of those songs released to country radio, and am really wondering why that hasn’t happened by now. 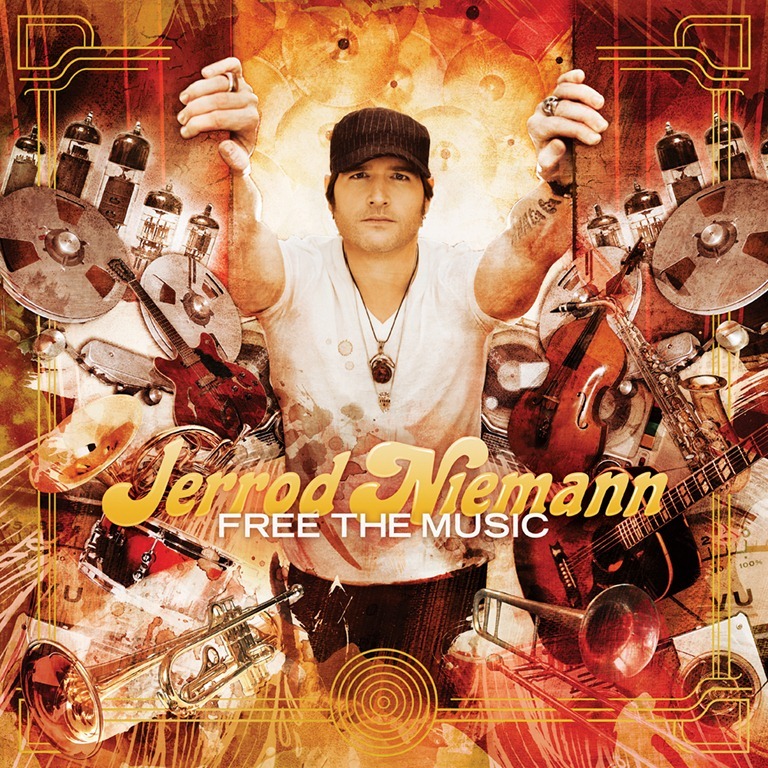 The second song from this album that Jerrod released to radio, was “Only God Could Love You More.” Jerrod co-wrote that one with Lee Brice and Jon Stone. It’s another slow one that gives Jerrod a great chance to show off his vocals. “Honky Tonk Fever” puts me more in mind of what you might hear in a jazz club, or even a 1920s speakeasy. It’s really not country, but it really is good. It’s a fun song. The kind of song that makes you smile, but you really aren’t sure why. Jerrod wrote this one without any help from any of the great writers who co-wrote many of the other songs on this album. Jerrod wrote or co-wrote every song on this album. I wouldn’t be surprised if we see Jerrod’s name in the ‘written by’ line on upcoming albums by some of country music’s best known entertainers. In addition to writing the music on this album, Jerrod also co-produced the CD. Here is the track list, with authors: Free the Music, Jerrod Niemann; Whiskey Kind of Way, Jerrod Niemann, Randy Boudreaux; Get On Up, Jerrod Niemann, J.R. McCoy, Jesse Clingan; I’ll Have to Kill the Pain, Jerrod Niemann, J.R. McCoy, Arlos Smith; Only God Can Love You More, Jerrod Niemann, Jon Stone, Lee Brice; Shinin’ on Me, Jerrod Niemann, Rob Hatch, Lee Brice, Lance Miller; Honky Tonk Fever, Jerrod Niemann; Guessing Games, Jerrod Niemann, J.R. McCoy; It Won’t Matter Anymore, Jerrod Niemann, Rob Hatch, Lance Miller; I’m All About You (featuring Colbie Caillat), Jerrod Niemann, Richie Brown; Real Women Drink Beer, Jerrod Niemann, Houston Phillips; and Fraction of a Man, Jerrod Niemann. “This album is my interpretation of how I feel about country right now,” Jerrod said. “It’s a project honoring many different layers and colors that have appeared in the country genre since recorded music began.” Jerrod also explained that the pedal steel guitar wasn’t always in the country music picture, even though it has since come to define the genre. When Jerrod was first starting, he did one tour of U.S. radio stations that brought him to Bristol’s Steel Creek Park, where he put on a free show of a crowd of fans that showed up to enjoy his music, and meet the artist. As so many artists do when they first get a song out on country radio, Jerrod was eager to spend a little time with his fans, signing autographs, posing for pictures, sharing his music, and pretty much giving everyone a chance to get to know who he is and what he does. To keep up with what’s going on in Jerrod’s world, including upcoming shows, new videos, and new music, visit his web site www.JerrodNiemannOfficial.com, and follow him on Twitter @jrodfromoz (that’s Jerrod from Oz, he’s from Kansas). This will tell you just a bit about Jerrod’s sense of humor, too. In addition to following him on twitter, you can follow his bus. And the bus will answer your tweets, too. Just go to Twitter, and follow JerrodsBus. Be sure to check our web site, too, www.countryschatter.com, and follow us on Twitter @countryschatter.